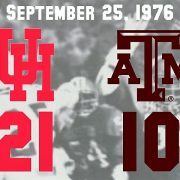 On September 11, 1976, the University of Houston arrived on the big stage. Bill Yeoman and his Cougar football team were in Waco for the school’s first-ever Southwest Conference game. After 5 years of waiting, UH beat Baylor, 23-5, in a game that would go down in Cougar lore. 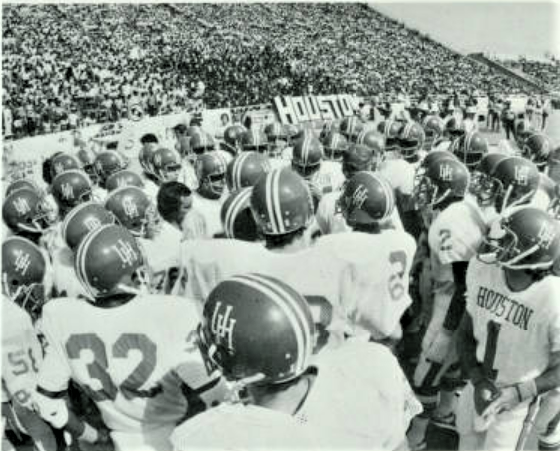 Houston started recruiting for the SWC in 1972 and signed a star-studded class in early 1973. That class would become the backbone of the team that entered the SWC and included seven players that would be all-conference. 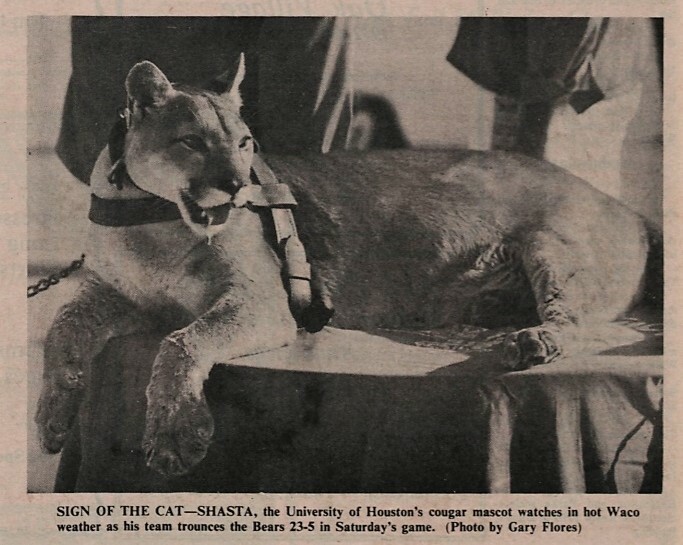 The Cougars won 11 and 8 games in ’73 and ’74, respectively, including a stretch where they went 23-3. As the program set its sights on entering the SWC, the 1975 season developed unexpectedly. 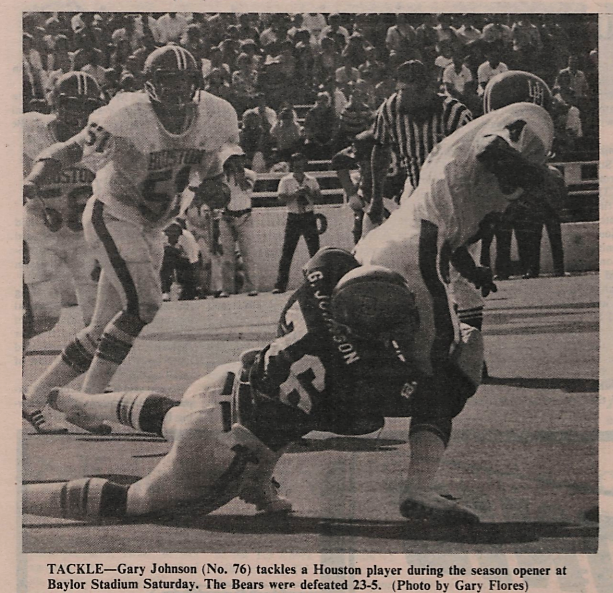 UH slipped to 2-8 in 1975 as the UH defense allowed 245 total points. To put that in perspective: from 1951 to 1981, the Cougar defense gave up 208 points or more just twice: 1975 and 1977 (UH followed up both of those “bad” defensive years with SWC titles). The 1973 recruiting class included 7 players that would be All-SWC. 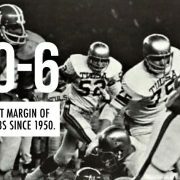 In addition, the ’75 team scored just 18 points a game. The offensive and defensive outputs were both career-lows for Yeoman at that point in his career. But people around the program believe that the ’75 Cougars weren’t really a bad team. Even the head coach. 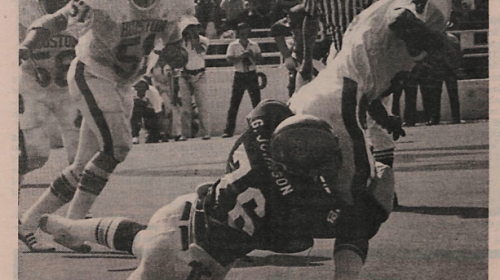 “We were probably the best two-win team in the country,” Yeoman said about the 1975 season. A rash of injuries, a lack of seniors, and players pressing too hard all contributed to UH’s first losing season since 1965. As the calendar turned to 1976, the Cougars were focused on making a statement in their first year in the league. Student manager Mike Brem coined the term “Think Cotton” to help put the goal in focus. 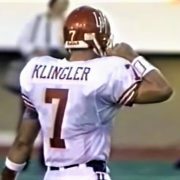 “We put (Think Cotton) on the back of the “Camp Fun” jerseys in the spring of ’76,” Brem says in discussing UH’s infamous training and conditioning program. 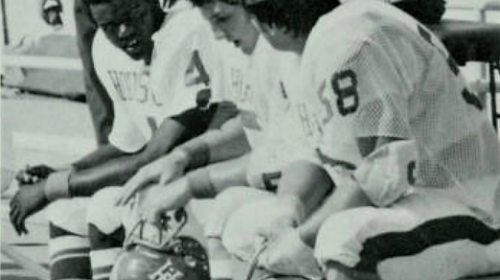 Freshman quarterback Danny Davis showed up to Camp Fun in spring 1976 in a gray t-shirt that read: 1976 SWC CHAMPS. Davis won the starting job for the upcoming season and wore the shirt in every conference game. 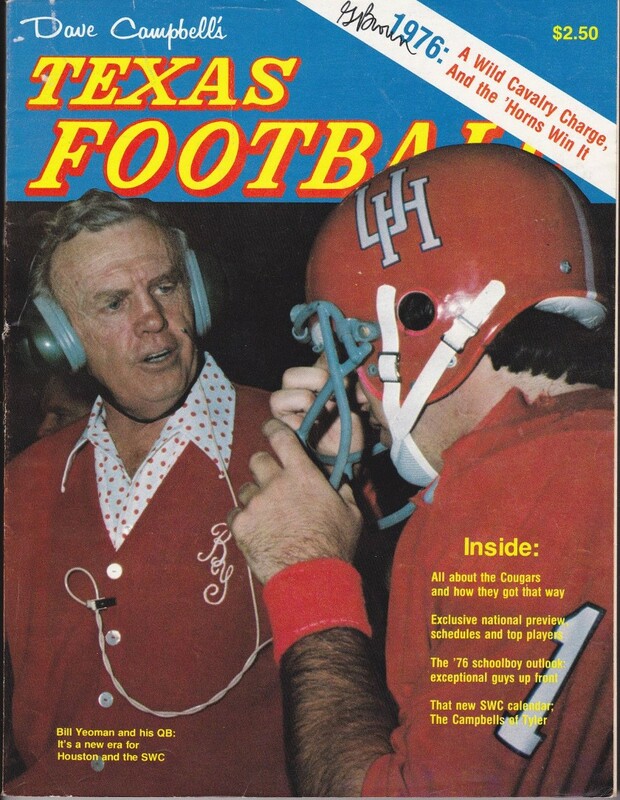 As his team prepared to enter the SWC, Coach Yeoman was featured on the cover of Dave Campbell’s Texas Football. Despite four SWC championships, it would be his only DCTF cover. 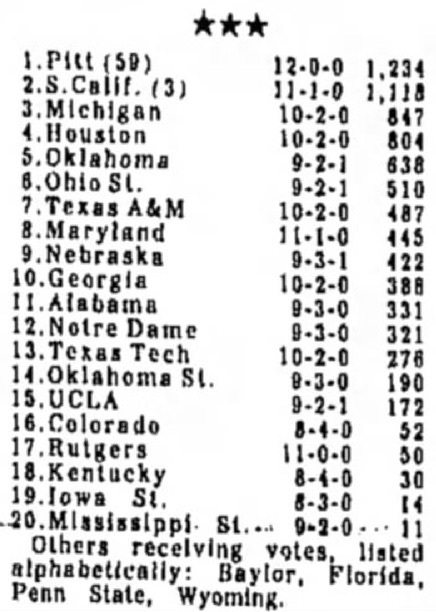 Even with a decade of winning behind them, the Cougars weren’t given much respect in the summer of ’76: UH was picked 6th in the SWC Writers Poll and were an early four-point underdog to Baylor in week one. But truth be told, even Yeoman didn’t know what to expect. “I hoped we’d be competitive, but after shooting eight blanks I didn’t know what to expect,” Yeoman quipped. Yeoman treated every game like a business trip but even he knew this was different. It would be impossible for his players to not understand the significance of the Baylor game. Finally, the Cougars were part of the league. They were playing for the right to go to the Cotton Bowl. And they were playing against the best in Texas and therefore, the country. The players couldn’t help but be excited for this moment in history. The Cougar offense started the game slowly. In the first quarter, UH failed to pick up a single first down. The Coogs only had 66 yards in the first half and did not score. Six minutes into the game, UH center Chuck Brown snapped the ball over punter Jay Wyatt’s head leading to a safety. On the ensuing drive, Baylor drove down to the 11 but had to settle for a field goal. The Bears would not score again. Just as they had in the first half, the Cougar defense dominated in the second. 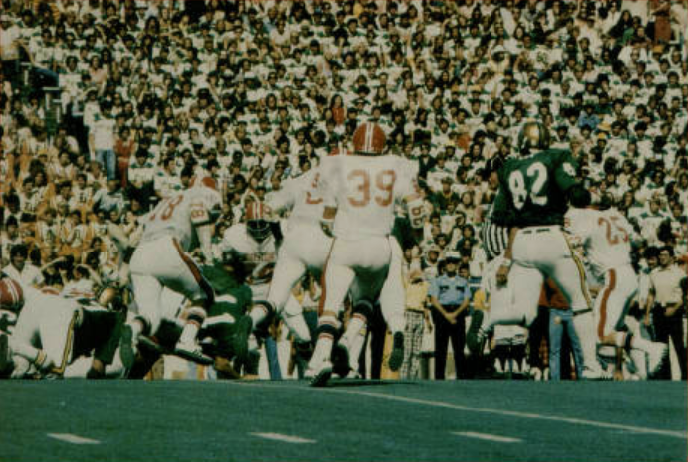 The Mad Dogs created four turnovers: Grady Ebensberger grabbed a Baylor fumble and David Hodge, Mark Mohr, and Anthony Francis each picked off a Baylor pass. Francis would lead the country in interceptions in 1976. And the offense came around, too. Six different Cougar rushers carried the ball in the second half as the the Veer started rolling. Danny Davis scored UH’s first SWC touchdown in the 3rd quarter (two-point conversion failed) and the Coogs led 6-5. 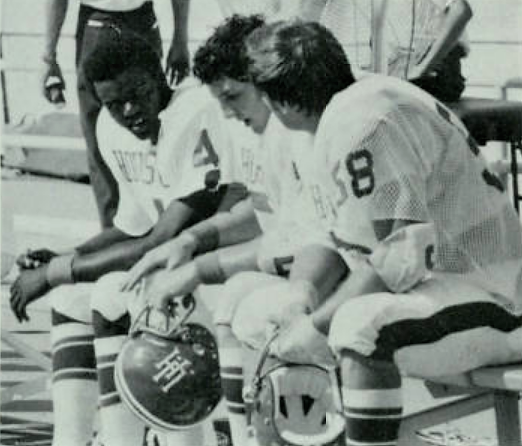 Danny Davis (4), Chuck Brown, and Mike Spradlin (58) discuss the UH offense. Houston controlled the 4th quarter as well. Running back Dyral Thomas scored twice and Lennard Coplin kicked a FG as UH scored 23 unanswered points. Houston didn’t turn it over and were closing-in on their first SWC win. With 3 seconds left in the game, Coach Yeoman called a timeout to allow his players and the UH fans to savor the moment. The Cougars beat Baylor 23-5. The Cougars finished the regular season 9-2, beating Texas and A&M but losing at Florida and against Arkansas at Rice Stadium. The team only played one SWC game in the Astrodome thanks to a rule that allowed visiting teams to choose between Rice and the Dome. The vagabond Cougars overcame all obstacles to win the SWC title, beat Maryland in the Cotton Bowl, and finish 4th in the country. And it all started on that scorching afternoon in Waco when the Cougars finally arrived in the SWC.